On Sunday, AFP reports in Arabic, Iraqi forces continued their advance on Mosul despite the car bombs and sniping tactics of Daesh (ISIS, ISIL). They moreover were able to expel a whole group of Daesh fighters. Sunday morning, the Peshmerga, the paramilitary of the Kurdistan Regional Government in Iraq, announced that they had launched a big campaign on Bashiqa to the north of Mosul, deploying 10,000 men to take the city back from Daesh. By late Sunday, the town was in Peshmerga hands. Its inhabitants had been largely Izadis (‘Yazidis), members of a folk religion with old Indo-Iranian influences. But many of them had fled when Daesh took over the town in 2014, since it considers them wretched heretics and has displaced, killed or enslaved hundreds of thousands of Yazidis. The Peshmerga also took 7 other villages in the area and gained control of the highway heading from Bashiqa toward Mosul. In a remarkable development, the Peshmerga Kurds received artillery support in the Bashiqa campaign from the Turkish army! Relations between the KRG in northern Iraq and Turkey have fluctuated a great deal, and sometimes have been tense. (Turkey is 20% Kurdish and fears ethnic separatism in its own southwest. The PKK terrorist group is seen by Ankara as the main secessionist threat, and it has bases in the KRG.) But apparently Daesh is so awful that it has managed even to bring Turkey and the Iraq Kurds together against it. The Kurds are also receiving US air support, and US Secretary of Defense Ashton Carter visited Erbil on Sunday to conver with Kurdistan presidetn Massoud Barzani about the campaign. 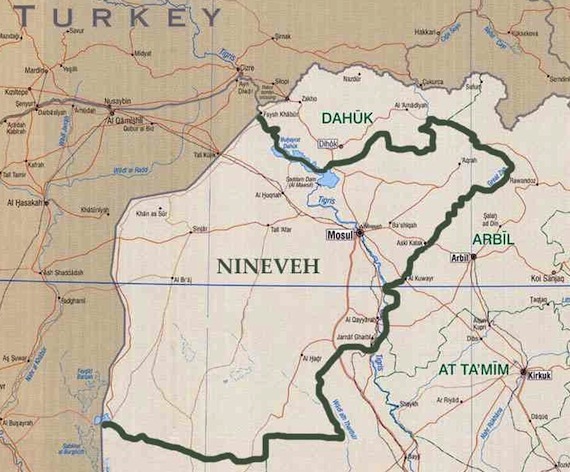 One complicating issue here is that Bashiqa is coveted by Kurdistan nationalists in Iraq for their super-province, but lies in majority-Arab Ninewah Province. It may well be that Baghdad will now never get it back. The campaign to take Bashiqa was launched two days after a Daesh infiltration of Kirkuk, which was de facto annexed by the KRG in summer of 2014, in which dozens of fighters and suicide bombers sought to take over government buildings there. Peshmerga forces are still hunting down the perpetrators, who failed in their attack, and who have fled into the countryside east of the city. Some 54 Daesh fighters involved in that attack have been killed. Some 46 Kurdistan security personnel and others are dead at the hands of Daesh in Kirkuk, as well. It is estimated that Mosul is now held by 3,000 to 5,000 Daesh fighters inside the city and another 2,000 positioned on its outskirts. The fighting so far has for the most part been in the regions around Mosul, which are thinly populated, and so has produced about 5,000 refugees, who, the UN says, are in dire need of humanitarian assistance. It is feared that when the fighting reaches the center of this city, where about 1 million still reside (down from 2 million in 2013), it will produce a massive wave of refugees.